We’ve spent more than a decade engaging people in conversations about health and developed sophisticated behavioral tools to capture and distil attitudes, behaviors and motivations affecting health decisions and resulting consequences. The old healthcare model – a reactive system that treats acute illness after the fact – is fast evolving to one more centered on patients, prevention and ongoing management of chronic conditions. Such a shift requires providers to think beyond traditional episodic treatment, and embrace disease prevention and long-term health management. To accomplish this cultural transformation, healthcare providers must understand and influence patient behaviors to incentivize and guide patients to make appropriate changes that result in superior health outcomes. In short, create immersive patient experiences that ensure a healthier, engaged and activated population. Scriplogix has developed an unequaled understanding of how to move healthcare consumers to action. We’ve amassed substantial health data assets on attitudes, behaviors, and motivations from over 10,000 U.S. physicians, scores of CEO’s and COO’s of healthcare organizations, and 100,000’s of consumers and patients. We’ve learned which approaches are most effective, which fall flat, and how patient engagement varies across a wide range of traditional and non-traditional healthcare consumer segments. Our platforms and tools seek to “activate” patients to assume greater responsibility for their health outcomes, helping providers thrive in today’s shared-risk environment. We’ve fused our vast behavior analytics experience with the groundbreaking work of distinguished behavioral researchers and scientists such as B.J. Fogg, Ph.D. (Stanford University Persuasive Technology Lab) and others from Princeton, Stanford and Harvard. Any attempt at driving desired health behaviors must integrate patient behavior profiles in both risk and engagement and draw from a repository of empirically tested “triggers” (communication and incentives) that map to the health condition (diabetes, depression, COPD, CHF, etc.). Risk segmentation is the first step in identifying “triggers” that would nudge the patient towards desired health outcomes. There are a small number of critical behaviors that drive non-linear improvement in results and generate a cycle of escalating commitment. However, nudging patients towards desired behavior would depend on how actively and continuously engaged they are in their care process. It would also depend on the appropriate incentive, applied at the right time through the right medium that converts the nudge to action. The Scriplogix Intelligent Patient Activation Platform , MoBe Maps (Motivational Behavior Mapping), empowers providers (and plans) with a personalized set of tools to influence patient behavior and shift greater responsibility for patient well-being to the individual. MoBe Maps leverages a person-focused paradigm that uses a behavior-based methodology (in addition to a disease-based orientation) to drive sustainable patient behavior change. Is a recursively learning platform that algorithmically evaluates the effectiveness of the nudges, timing, frequencies and communication modalities used against established goals, e.g., is the patient more adherent to their medications regimen and are they achieving their weight goals? If not, what alternative interventions can be recommended to better align “nudges” (triggers) with desired results? MoBe Maps uses segmentation and behavioral modification tools to cluster patient population into micro-segments of risk using a configurable series of data “vectors” including medical history, lifestyle risk, behavioral profile (beliefs, attitudes, expectations, motivations), treatment and care, ability profile (time, cost, physical effort, social impact, impact on routine), etc. 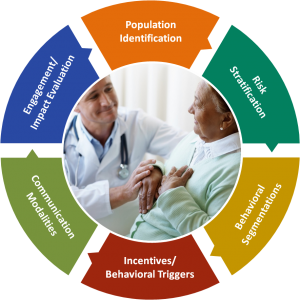 Once a population is micro-segmented, key patient subgroups are identified and personalized interventions called “nudges” trigger a patient to action. “Nudges” or “smart darts” are recursively learning algorithms that constantly evaluate how well the triggers are doing in relation to patient therapy goals and automatically adjust their delivery mechanism, timing, frequency, incentives, etc. to ensure impact. 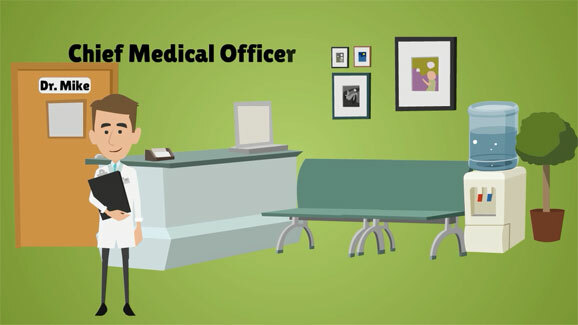 Patient Risk Identification and Profiling: Behavior and ability segmentation tools measure patient self-management readiness using a configurable series of data “vectors” including primary data and secondary data. Patient Behavior and Triggers: A proprietary repository of “triggers” by disease condition guide patients along the self-management readiness continuum, eventually delivering the desired behavior change. Game Mechanics & Game Dynamics: Unique, interactive experiences that engage, educate and empower participants to form new habits and eliminate old ones, while keeping them engaged and motivated. Social Media and Patient Sentiment Analytics: Analyze posts, surveys, messages, etc. to detect mentions of organizations, departments, employees or processes, and to identify topics and analyze opinions (sentiment). Unstructured Text Analytics: Ontology-driven extraction framework sifts through unstructured and semi-structured survey data, clinical notes, insurance claims, lab results, etc. and make it ‘analyzable’. Patient Satisfaction: Track at-risk patients in real time, from hospitalization through discharge and beyond, allowing staff to immediately identify areas of concern and determine root causes to help correct them. Medication Adherence: Tailor transitional care intervention strategies to patients at high risk of not adhering to their medications. A continuous feedback loop helps uncover adherence non-compliance before it escalates into problems. Readmission Prevention: Predictive algorithms and risk models help determine at discharge, those patients at risk of readmission. Intervention ”triggers” keep patients motivated, engaged and active participants in their own care. Scriplogix is a market research, behavioral design and analytics company focused on delivering strategic insights for healthcare, life sciences and wellness.